Are you looking into starting a period drama or a more laid-back drama after a long day? Untouchable Lovers 凤囚凰 may be the one for you! 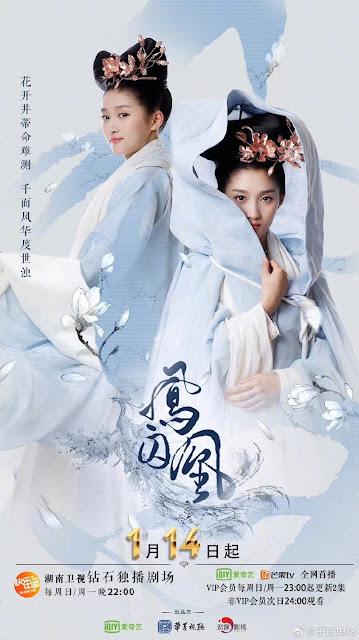 Synopsis: This 52-episode drama is based on a novel by the name of A Tale of Two Phoenixes by Tian Yi You Feng. In a kingdom led by a tyrant, a powerful organization by the name of Tianji Tower seeks to overthrow Emperor Liu Zi Ye. Coincidentally, a woman who looks exactly like Princess Liu Chuyu is sent to the Emperor's side as Tianji Tower's spy. While Zhu Que impersonates the Emperor's sister, she meets Rong Zhi, the Princess' trusted confidante and a Northern Wei's spy. 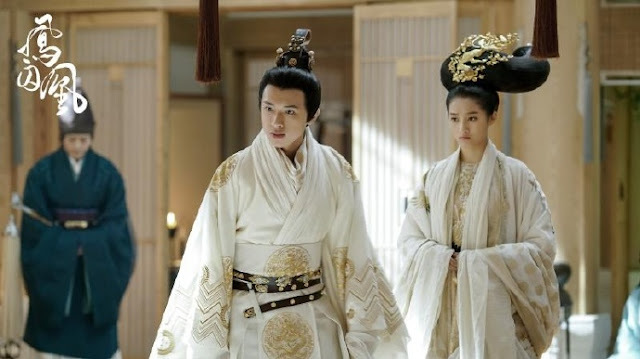 Princess Liu Chuyu (Guan Xiao Tong) is known for her great beauty and her promiscuity. While a majority of period dramas feature males with multiple wives, it was refreshing to see a polyandry instead. I absolutely love their white outfits, making them appear more heavenly. I cannot imagine getting myself in a situation where I suddenly end up with a male harem. 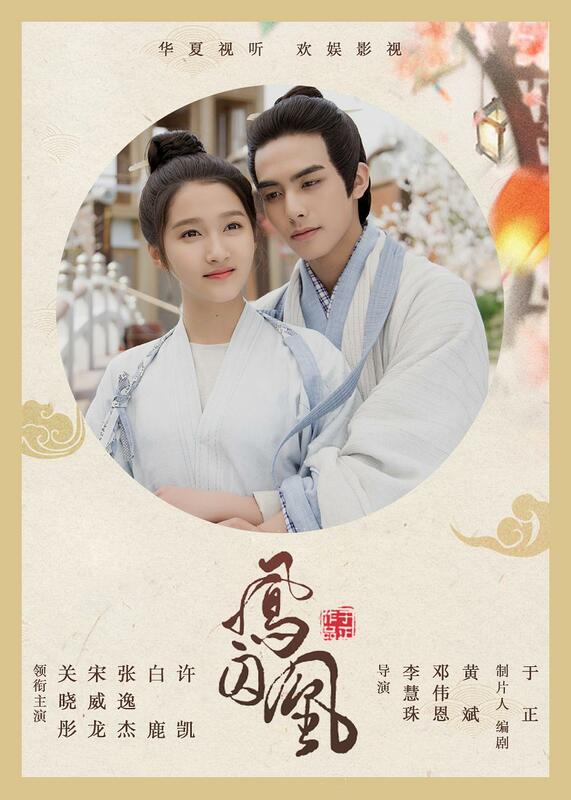 The drama begins with a strong ship with the two main leads, Zhu Que (Guan Xiao Tong) and Rong Zhi (Song Wei Long). Zhu Que wakes up in her bed next to Rong Zhi. Favored by the Princess, Rong Zhi had much power in her manor. Thus, the first task Zhu Que pursued was to remove his dominance; she followed with the next task of removing the male harem to prevent her true identity from being exposed. As a kpopper, I was so surprised to hear that Luhan's girlfriend stars in this drama, even more so than when I heard of their dating to marriage rumors. I personally do not find Guan Xiao Tong's acting to be exceptional nor do I disapprove of her acting. However, that may change in the next several episodes. This drama is perceived in third person, but mainly in Chuyu's point of view. I tend to prefer dramas with strong female leads, but I have yet to see her character develop. As for my first impression of Rong Zhi, it seems like Song Wei Long has another fan! Can we just take a moment and appreciate how handsome he looks with long hair? I absolutely love how reserved and intelligent Rong Zhi is. While he has not shown many emotions because of his character, I hope that I can see more of his acting in further episodes. 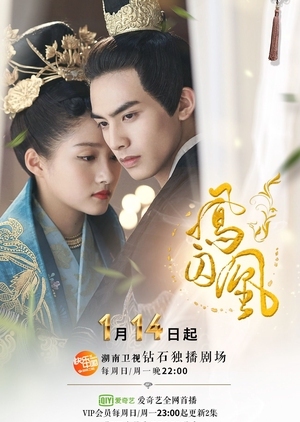 With the opening characterization of the drama, Rong Zhi and Zhu Que as Chuyu are taking most of the spotlight. Their first scene together and the overall first episode made a strong impression that got me into this drama series. I like how different the plot is compared to most cliche dramas. In regards to the chemistry of the main leads, I love where their relationship is headed from initial caution to familiarity. The first few episodes of Rong Zhi and Chuyu trying to outwit each other has got me excited to see the next episodes. As the two continue to undergo trials together, their attraction to one another is undeniable. I am definitely rooting for the two main leads! 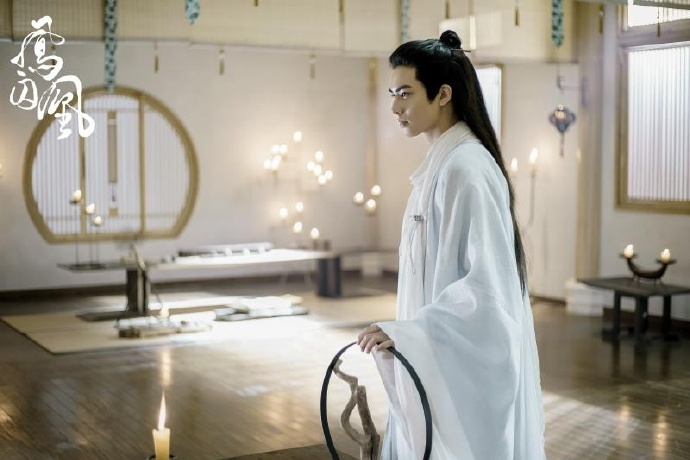 Seeing Zhang Yi Jie in this drama as the Emperor, I personally feel a sense of familiarity from watching his webdrama, King is Not Easy. It also doesn't help that this drama also features Bai Lu, who played the female lead in the webdrama. I enjoyed the webdrama, so I similarly like their acting. Zhang Yi Jie's character as an emperor is just as obnoxious, or even more so. The Emperor's obnoxious behavior provides a nice break from the main couple. As Zhu Que grows closer to the Emperor, she finds that the Emperor may not be as ruthless as he may appear. There is a soft younger brother side of the Emperor that makes Zhu Que believe that with proper guidance, the Emperor can be a benevolent and honorable emperor. With time ticking and repeated failures in preventing bloodshed, Zhu Que is pushed to her limit. Their sibling relationship may be too close for me to personally imagine myself being in with my siblings. Always whining and holding his sister's arm, the Emperor lacks the maturity needed for him to rule. Overall, I enjoyed the casting and the acting. The cinematography and outfits were beautiful. While there is a lot of characterization for Princess Chuyu, I wish there was more of other characters and development in the plot. Hence, I feel that this drama portrays more of a webdrama aura than that of an intense melodramatic period drama. However, the political background shows development; there is a large emphasis on politics, but it's not too overbearing. One aspect that I did not appreciate in this drama is amnesia. While Zhu Que was switched with the Princess, Zhu Que used amnesia as an excuse of her loss of memories. Zhu Que did not actually have amnesia, but the aspect of amnesia is a pet peeve of mine. I feel that amnesia is such an unnecessary addition into dramas, especially when the character will remember those lost memories anyways. Just something I wanted to share as a warning for those who are also not a fan of amnesia. I shall be looking forward to marathoning this series with this drama wrapping by next week. I highly recommend this if you are interested in starting a period drama for the first time or looking for a less emotionally-straining watch! If you are interested in hearing further drama reviews, you can check out my blog at dramasforscrubs.wordpress.com. At first I was okay with it, I cringed at some of the dialogue and the characters but the more episodes I watched the more addicting it is. I’m currently up to episode 33 and usually dramas around this time start to drag and get repetitive but this drama somehow makes things interesting. Also if you don’t like the big Poofy hairstyle, it gets removed once the main lead travels to Wei where she gets a nicer more toned down hairstyle. I definitely recommend it to people who likes romance and comedy. Also the second half of the drama focuses on the other characters as well so if you are scared there isn’t characterization of the other characters, it will happen. I just started marathoning this series, and I agree that there's more characterization that occur in the later part of the drama. Although I do agree that it looks too exaggerated, I personally respect the large hairstyle, especially with Guan Xiao Tong wearing it while she dives in water for her first appearance! If you leave expectations at the door and consider it a webdrama, it is quite a easy and fun drama to watch. I'm just waiting for the episode where we learn how the first part in Song and the second part in Wei ties together!